At first glance, it almost sounds crazy. Can we really take carbon dioxide emissions from an industrial plant and store them underground? To find out, research is currently taking place to test if such an idea is not only viable but safe, and prove that to the public. This approach is known as carbon capture and storage (CCS) and it's been around for decades but has never really taken off. In its recent reports, however, the UN Intergovernmental Panel on Climate Change (IPCC) said that CCS could have a key role to play if we're going to meet our climate goals in the coming years. If everything is done right, the signs are promising. Studies have shown that CO2 can be safely stored underground, such as in deep, porous rock formations, for thousands of years, and we've even found natural pockets of CO2 that have existed for millions. Public and scientific opinion on CCS remains divided, however, not least because the approach seems to encourage the continued use of fossil fuels rather than switching to renewable sources of energy. It's also unclear how much CCS can be scaled up. It is estimated that up to 90% of carbon emissions from the industrial use of fossil fuels could be captured by CCS, which has resulted in more than a dozen large-scale projects taking place around the world in the past two decades. But questions remain about how effective CCS really is, alongside low adoption rates due to a limited business case and lingering public concerns about safety. One major concern with CCS is that CO2 could leak out of these underground reservoirs into the surrounding air and contribute to climate change, or taint nearby water supplies. Another is the risk of human-made tremors caused by the build-up of pressure underground, known as induced seismicity. Scientists in a project called ENOS are conducting research at five test sites across Europe to examine some of the issues facing carbon storage. "The overall aim of ENOS is to demonstrate safe and secure storage," says Rowena Stead, project manager at France's Bureau of Geological and Mining Research (BRGM) which is coordinating the project. "That involves developing and testing techniques in the field and in real conditions." To investigate the issue of leakage and safe storage techniques, ENOS is carrying out research on the injection – or pumping – of CO2 into the ground at the Hontomin Technology Development Plant (TDP), near the city of Burgos in Spain, where CO2 is being pumped into a 1,600-metre-deep well alongside an underground reservoir. Running until September 2020, the project will use a variety of underground and surface-level sensors to monitor the wells and look for any gas that could be leaking out into the nearby water supply. ENOS will also use geophysical sensors to monitor any seismic activity, such as tremors, caused by injecting CO2. "The magnitude of such events is small, meaning that the risk of having any tremors at the surface is null," says Dr. Pascal Audigane, head of the groundwater resources unit at BRGM. "But geophysical monitoring tools can detect these events to prevent any risk of unexpected pressure." ENOS will model how seismic waves caused by CO2 injections move through the ground. The idea is that if we know how these tremors are caused, this could then help with the selection of future carbon storage sites that pose minimal risk. At two more sites in the UK and in Sardinia, Italy, which are due to begin injecting soon, ENOS will also conduct experiments to understand how overlying rocks or faults – places in the ground where rocks slip past each other—contribute to leakage. These experiments are designed to help build better detection tools and select safe sites. Key to ENOS' research will be not only to test if CCS is safe and viable but also to address public concerns. According to Stead, ENOS has been holding meetings with local communities near the test sites to answer their questions and explain how the technology works. 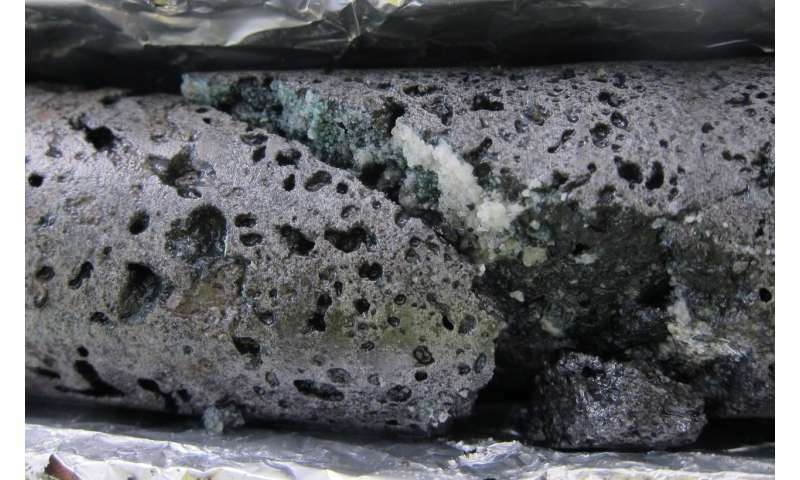 While ENOS is still testing the safety of carbon storage, another project called CarbFix2 in Iceland is demonstrating how to capture, transport and store carbon permanently as a mineral. This builds on an earlier project that tested how to capture and inject CO2 into rock formations. 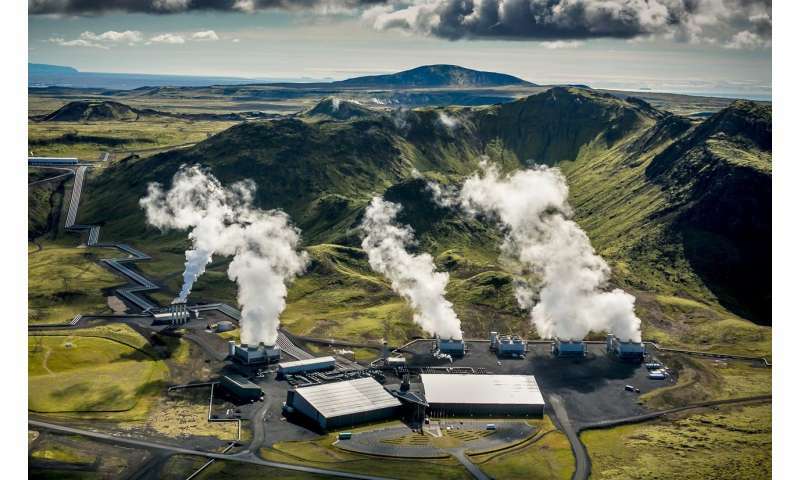 The project, which began in August 2017, will run for three and a half years and is taking place at the Hellisheidi geothermal power plant near the Icelandic capital Reykjavik. Here, CO2 is being captured from the plant, transported via pipelines and then stored hundreds of metres underground. To deal with the issues of leakage, CarbFix2 has a novel solution. They dissolve their CO2 in water before it is injected underground, meaning it is stored dissolved in liquid rather than a gas. And they've chosen basaltic rock as their storage point, which reacts with carbon to form calcite. "We are doing the injection in a totally different way than (traditional) carbon capture storage," said project coordinator Dr. Edda Sif Aradóttir, deputy managing director at Reykjavik Energy. "So we don't have to worry about leaks." To tackle seismicity the plant closely manages the injection of water and dissolved gases to avoid causing tremors in an already seismically active area. The type of rock is important too – a high permeability and porosity mean the CO2 can circulate more easily without getting clogged up. The biggest risk in this project does not come from the CO2 capture, transport or storage, notes Dr. Aradóttir, but rather from the co-capture of hydrogen sulphide (H2S), which is also produced at the plant. In high concentrations this can be poisonous, so care must be taken to avoid gas leaks in the capture process that could harm workers. CarbFix2 has demonstrated an entire CCS cycle by capturing, transporting and storing CO2 at €22 per metric tonne, which is less than half of previous cost estimates. Currently, their system captures about 35% of CO2 coming from the plant, but Dr. Aradóttir said there would be no issues scaling this up to 100%. "We have more than enough capacity theoretically to store permanently all the CO2 coming from burning (fossil fuels)," she said. Before that can happen, there would need to be the political will to invest in carbon storage, according to Dr. Aradóttir. Key to that will be addressing safety concerns. But if projects like ENOS and CarbFix2 can prove the technology is both safe and viable, then it might be important to our future. '(It) could be a major factor in the battle against climate change," she said. Could storing emissions underground be the answer? Carbon and oxygen are both useful chemicals and neither are greenhouse gasses on their own, it is when they come together that we have an issue. Separating this duo should be the long term goal, not sweeping the problem under the carpet. If you were to inject C underground, why you would extract hydrocarbons from beneath the ground in the first place. But, it's fun to make a mess first and then clean up. The article is begging the question that the energy sources are mutually exclusive. Nobody prevents you from also building renewable power. The concern seems to be that people would not, because fossil fuels are cheaper and easier to use, which only points to the fact that the renewable sources are known or assumed not to be mature enough for actual use - not competitive without strong-arm policy choices. If that is the case, if the CO2 problem can be solved even temporarily, it would save a ton of resources that are desperately needed for solving the other environmental problems, like pollution and poverty in the developing world. When the CCS solution has run out of its use, you have much more advanced technologies available at cheaper prices, and much more time to test them out before full-scale deployment. In short, if it is assumed that fossil fuels with CCS will stop people from building renewable power, that is an indirect admission that the renewable sources are actually the worse option for the time being. It's like saying, you shouldn't take aspirin for your flu because it only makes you feel better and doesn't cure the disease. That's true, but not taking the aspirin won't heal you any faster, so the choice is merely about not being miserable for the week. CCS doesn't cure the fossil fuel disease, but it takes the symptoms away until competing solutions mature. If competing solutions are already mature enough, then CCS won't displace them.